AL Advanced Leader – The second leadership program. It’s centered around District leadership and a leadership project. AG Area Governor – The Area Governor organizes Area activities and mentors the club President. Area A group of four to six clubs. ATM Advanced Toastmaster – The extension to the formal speaking program. It is centered around completing two of the Advanced Communication and Leadership manuals. There are fifteen Advanced manuals and three levels of Advanced Toastmaster (ATM-B, ATM-S and ATM-G). ATM Able Toastmaster – The forerunner to the Advanced Toastmaster program. It was centered around completing three of the Advanced Communication and Leadership manuals, and speaking outside the club. It had three levels (ATM, ATM-B and ATM-S). Better Speaker Series A series of 10 -15 minute modules covering various speaking related skills. CL Competent Leader – The first leadership program centered around club leadership. CC Competent Communicator – The first speaking program centered around the basis of speaking using the Basic Communications and Leadership manual. DG District Governor – Leader of the District. District A group of Divisions. District 7 has eight Divisions. Division A group of four to six areas. Division Governor Organizes Division activities and mentors the Area Governors. DTM Distinguished Toastmaster – The culmination of the communication and leadership tracks. HPL High Performance Leadership project – A project that involves setting a goal and organizing a group of people to achieve that goal. The participant is aided by a guidance committee. This is part of the Advanced Leader program. ID International Director – One of the members of the Board of Directors for Toastmasters International. The Leadership Excellence Series A series of 10 -15 minute modules on excellence in leadership. Topics include the importance of a vision to a leader, the leader as a coach, motivating people and delegating. Per cap Each time a person pays dues. If a member joins in August, renews in October and in May, they are counted as three per caps. Region A group of Districts. Semi annual report The dues and list of members that each club sends in twice a year. SpeechCraft A condensed version of what is learned in Toastmasters for non-Toastmasters. This program is a good introduction to Toastmasters. Success Communication Series A series of 1 – 3 hour modules on topics that include creative thinking, becoming a trainer, effective listening and effective evaluations. The modules can be customized for shorter meetings. These modules are a good introduction to presenting a workshop. Success Leadership Series A series of 1 – 3 hour modules on topics that include the characteristics of an effective leader, developing leadership skills and working in the team environment. These modules are a good introduction to presenting a workshop. Successful Club Series A series of modules aspects of a successful club. Most modules are 10 – 15 minutes in length. The Moments of Truth module requires more time because of the discussion. 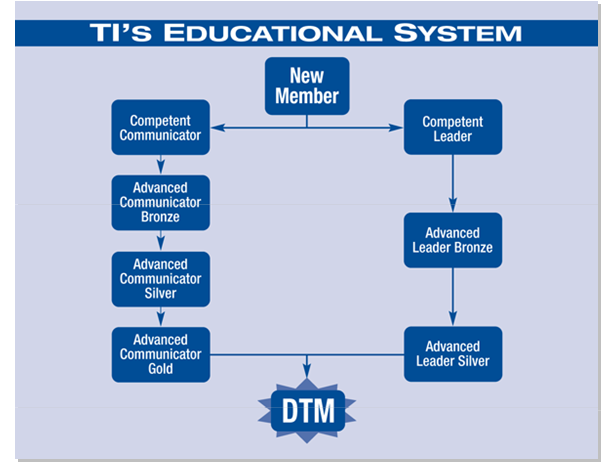 TI Toastmaster International – The largest, worldwide organization devoted to oral communication and leadership. TLI Toastmasters Leadership Institute – An officer training program that has several time slots with multiple programs available during each time slot. Youth Leadership A program presented by Toastmasters for grade school, middle school and high school aged youth. It can be presented to any group. It’s formatted similar to a Toastmaster club.